Foreign Policy: China's Left Behind Children Breakneck growth has made China an economic miracle. Deborah Jian Lee and Sushma Subramanian of Foreign Policy tell the story of a disrupted rural family in Silong, China, and wonder if the destruction of families will prove to be too high a cost for growth. A father says goodbye to his child at the West Railway Station on Jan. 7, 2012 in Beijing, China. China's railways brace themselves each year as millions of migrant laborers leave cities for their native villages to celebrate the Chinese New Year. Deborah Jian Lee and Sushma Subramanian are freelance journalists based in New York City. When Huang Dongyan visited home to celebrate the Lunar New Year in 2011, her son refused to call her "Mom." Huang, 38, tried coaxing him with baby talk and tickles. But five-year-old Zhang Yi ignored her and buried his face in his hat. For the rest of her visit he avoided her, favoring the attention of his 17-year-old sister, Zhang Juanzi, instead. Huang's every attempt at intimacy — games, shopping trips, cuddles — was rebuffed. "I was a stranger to my son," Huang recalls, blinking back tears. Just three decades ago, Shenzhen was a small fishing village. Today it boasts a GDP of roughly $150 billion and houses factories making goods for the world's best-known companies, including consumer electronics maker Foxconn, which employs an estimated 230,000 workers in its Shenzhen plant. This is the story of one migrant worker family coping with the changes wrought by China's breakneck growth. After Huang moved away, her mother-in-law watched over the grandchildren in Hunan, as Huang's work schedule only allowed for visits once or twice a year. Huang and her husband, Zhang Changyong, left their oldest child Juanzi in 1998, when she was only four. Over time, Juanzi grew detached. By sixth grade the moon-faced girl who once wept at the sight of her departing parents appeared to barely notice their visits. She grew bored with their attempts to catch up on her life. Answering their phone calls became a chore — except when she needed money. Her brother, little Yi, disconnected at a younger age by refusing his parents' phone calls and crumbling into his sister's arms when they approached for hugs. "My son didn't like being with me," says Huang, who, like many peasants, was allowed two children under exceptions in the one-child policy. For more than three decades, rural residents in China have relocated to industrial cities for work, comprising the largest migration in human history. Today the country has some 221 million internal migrants, according to the 2010 census, of whichroughly two-thirds move from rural to urban areas. But while this migration has fueled China's economic growth, it has also churned up domestic turmoil and social dislocation. The hukou system, designed to control migration and fuel economic success, provides a steady trickle of cheap labor to cities rather than a surge, which Chinese officials fear could lead to unrest and urban discontent. Enacted in the 1950s, the system made it difficult for peasants to move to the cities and granted urban citizens a wealth of social benefits that their rural counterparts weren't eligible to receive. Two decades later, as industrial hubs discovered their growing need for low-cost laborers, officials opened the floodgates. But there was a catch: Officials denied rural migrants the social benefits that longstanding residents enjoyed in these cities. Zhang Jiru, a former factory worker who founded Spring Breeze, an NGO that advocates for factory workers' rights, says the hukou system does a huge injustice to rural families. "No one can deny that the migrant workers are the real fortune creators in China, but who are the real beneficiaries?" he asks. "The Chinese government and the local urban residents." Away from her children, Huang passes her free time — just a few hours a night — in front of the TV. Sometimes she grabs a midnight snack with her girlfriends. Dressed in skirts and strappy heels, the factory women giggle over bowls of rice and swap stories about the children they never see. "Sometimes I feel like I'm still 20," Huang says. Huang tries to parent from afar, but the phone calls bore Juanzi, a playful, self-assured teenage girl who calls her mother a chatterbox. The only time Juanzi seems engaged, Huang says, is when she needs money to pay for new clothes or more minutes on her cell phone. Huang's son Yi often refuses to speak with her unless his grandmother gives him coins to buy candy at a local store. When he gets his money, he picks up the phone, says hello and then hangs up right after. "Now I only call when I'm in a good mood," Huang says. As for her husband, Huang sees him about once a week, but the reunions are no longer exciting. "Now that we're older," she says, "we're no longer romantic." Huang's only break from Shenzhen life came five years ago, when she got a troubling call from her sister-in-law, urging her to come back home. Villagers had begun to gossip that Juanzi, then 12, had been ditching school, acting recklessly with friends, and getting cozy with local boys. "You need to be here," her sister-in-law said. When Huang got the call about Juanzi's wayward behavior, she took a six-month leave from work to attend to her daughter, sitting her down for several long talks. "When you miss out on an education you become an unskilled laborer for life," explained Huang, who left school before completing junior high. She made Juanzi write her a letter promising to focus on her studies; otherwise, she would have to get a job alongside her mother at a factory in Shenzhen. Huang believes those six months saved her daughter from destruction. Juanzi wrote the letter, tamed her quarrelsome tongue, and obeyed all of her mother's wishes. She returned home every night to study and to sleep in her own bed. To Huang, Juanzi's obedience signaled reformation. But to Juanzi, it was a temporary concession she endured until her mother returned to Shenzhen. "I don't think [those six months] caused much change," Juanzi says. She stopped arguing, but that was because she preferred silence to her mother's "hot temper," she says. Once her mother returned to Shenzhen, Juanzi returned to her old life. "My mom doesn't know much about me," she says, adding that her mother seemed more tuned into village gossip than what was really going on in Juanzi's life. "I wasn't playing hooky," she insists. As for her closeness with boys, Juanzi admits that she had platonic guy pals, the kind she would call "bro" and joke with after school. Then, when one of them patted her shoulder in plain view of the local gossips, her reputation plummeted. Privately, Juanzi mourns that she and her mother barely know each other. This parent-child disconnect, forged after so many years of absence, seems irreparable. Juanzi's voice falters when she reflects on the day-to-day intimacy she never enjoyed with her mother. "It's like something stuck in my heart," she says. "I cannot breathe." 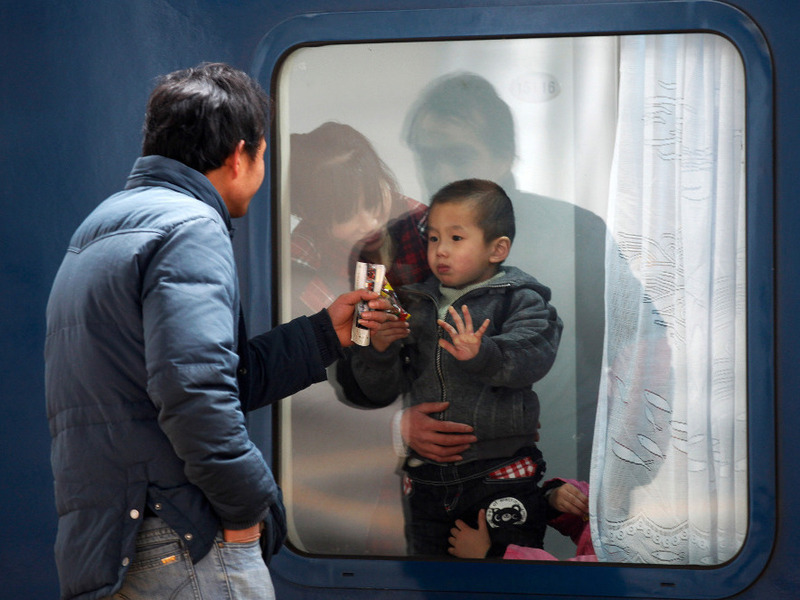 Some migrant workers move their children with them to the city. Xiao Hongxia, the founder of the women's migrant group Time Women Workers Service, moved her two children from their rural Hunan home to Shenzhen in an attempt to rescue them from village isolation. But sending children to school in Shenzhen costs approximately $160 to $320 per semester per child, according to various migrant parents interviewed, whereas rural education — which is admittedly substandard — ranges from around $63 to $95 per semester per child. Huang and her husband together earn roughly $781 a month. Paying private tuition for two kids in the city would have been impossible. Staying in the village isn't practical for the parents either. Back on the farm, Huang's mother-in-law tends fields of peanuts, string beans, corn, and chili peppers. A few chickens and goats stalk around the farmhouse, but that's hardly enough to sustain a family. "For us rural people, life is not affordable if you do not work outside for money," Huang says, pointing to the dearth of young adults in her village. "We have no choice." Improvements in farm technology have reduced the need for physical labor in the countryside, and cheap consumer electronics like televisions and cell phones have exposed village dwellers to the opportunities and material pleasures of city living, says University of Washington geographer Kam Wing Chan, who has studied the hukou system. He notes that technology and migrant life have improved village conditions, but have also forged a sort of "keeping up with the Wu's" mentality. When parents decide to stay in the village, they deny their family the financial security and comforts that other villagers enjoy. Since her last trip home during the 2011 Lunar New Year, Huang has rethought her approach to parenting. With Juanzi grown up and distant, Huang worries that the same fate awaits the relationship between her and her son. After months of discussion, even though their combined salary would barely support it, Huang and her husband decided to bring Yi to the city with them. So on a sultry July day in 2011, Huang packs her bags for the long journey home to Silong to collect Yi. Juanzi, who recently started a job as a kindergarten teacher's assistant in a neighboring city, joins her mother on the trip. After a grueling, day-long, 500-mile drive from Shenzhen, the van drops them off at 4 a.m. near their farmhouse. The tiny mountain village is silent. Juanzi runs ahead, disappearing into a hilly forest, calling her brother's name. Through the darkness, Huang lets her feet guide her up the familiar curves on the road back home.